HOUSTON -- In a season when so much went right for Matt Ryan, the Atlanta Falcons quarterback was at a loss Sunday night to describe what went wrong in a soul-crushing 34-28 overtime loss to the New England Patriots in Super Bowl LI. Ryan, who won the league's MVP and offensive player of the year awards for his work in the regular season, saw the Falcons let a 28-3 lead slip away. "There's nothing you can really say," a somber Ryan said after the game. " ... There are no words." The Falcons, who led the NFL in scoring this season at 33.8 points per game, did not score on their last four possessions of the game and had just three first downs in the pivotal fourth quarter. "There's nothing you can really say," Ryan said. "That's a tough loss. Obviously, very disappointed. [The Falcons] were very close to getting done what we wanted to get done, but it's hard to find the words." Ryan had six 300-yard passing games and seven games with at least three touchdown passes this season. On Sunday, he finished 17-of-23 passing for 284 yards and two touchdowns. He did not throw an interception, but he was sacked five times and lost a key fumble. The Falcons were looking completely dominant for nearly three quarters, exemplified by this impressive swambunkering juke from Gabriel. However, this offensive dominance just couldn't last. The Patriots ran 47 more offensive plays than the Falcons (93 to 46) for the biggest play disparity in NFL postseason history, according to the Elias Sports Bureau. "We ran out of gas," Falcons coach Dan Quinn said. Ryan became the eighth consecutive league MVP to have played in and lost the Super Bowl. In his postgame review, Ryan pointed to two possessions on which things got away. "We just made some mistakes, and against a team like New England, those mistakes ended up costing us," Ryan said. The first of those possessions came with just over two minutes remaining in the third quarter and the Falcons holding a 28-9 lead when the Patriots tried an onside kick. Falcons linebacker LaRoy Reynolds recovered the ball at the Patriots' 46-yard line. A penalty tacked on moved it to the Patriots' 41 because New England kicker Stephen Gostkowski had touched the ball before it traveled 10 yards. Ryan hit tight end Austin Hooper for 9 yards on first down to open the drive, but Tevin Coleman lost a yard on the next play before Jake Matthews had a holding penalty. Ryan threw an incompletion, and then on third-and-11, Ryan took a sack for a 9-yard loss. Suddenly, after being on the edge of field goal range, the Falcons had to punt. "After the onside kick, the short field opportunity, felt like we should have come away with points there and didn't," Ryan said. 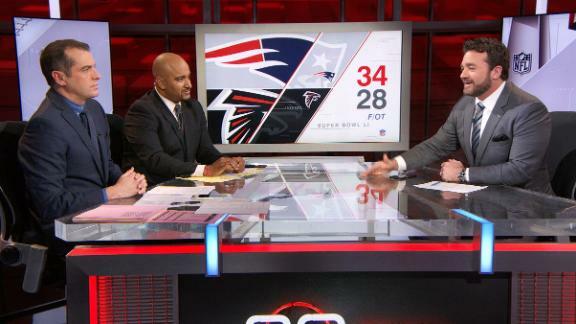 Ryan also pointed to the Falcons' possession in the fourth quarter when, with a 28-20 lead, the team had moved the ball to the New England 22-yard line with 4 minutes, 40 seconds remaining in regulation. At that point, if the Falcons simply kept themselves in field goal range, they would have made it a two-score game. But Ryan was sacked for a 12-yard loss, Matthews was flagged for holding again two plays later, and the Falcons were again forced to punt. "We were in field goal range [in the fourth quarter], and then we got pushed back out of field goal range," Ryan said. "We knew we had to come away with points in both of those." Ryan fumbled on a sack in the fourth quarter as well. The Patriots scored after all of those failed Falcons possessions. "Sure, we did some good things ... just made some mistakes in certain situations that put us behind the chains," Ryan said. "And we were not able to overcome that, and that part was disappointing." Matt Ryan tells Ed Werder how disappointed he is that the Falcons fell short of a Super Bowl win, but he says it'll only increase the hunger to come back and win next year. Jeff Saturday breaks down several situations that led to the Falcons' stunning Super Bowl loss to the Patriots.